Spend your money on games and stop worrying about your PC's memory, video card or processor speed. 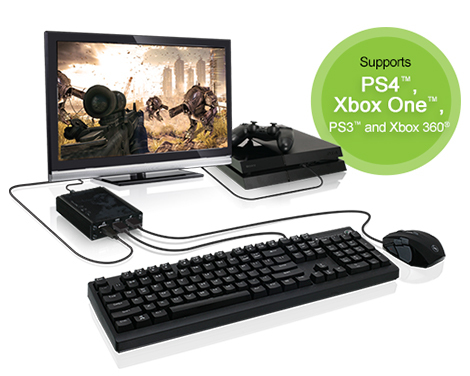 With a game console and KeyMander you can now plug in your keyboard & mouse to enjoy the latest games without emptying your pockets on new PC parts. 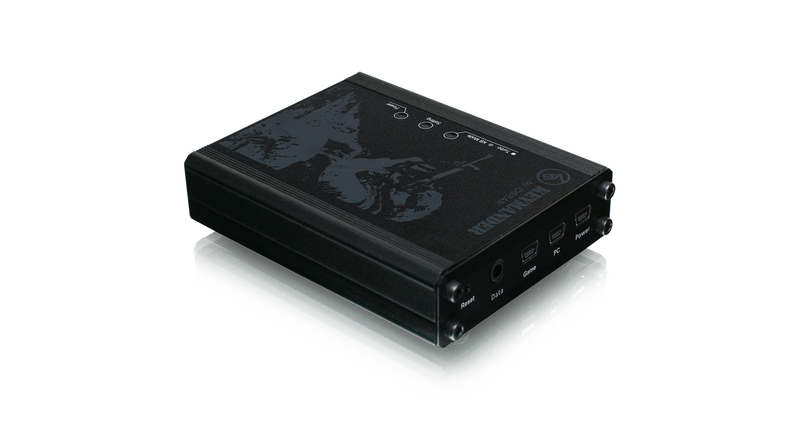 The KeyMander can be used on Xbox One X / Xbox One S / Xbox One and Xbox 360 to play your favorite FPS, RPG or RTS games. Increase your precision and accuracy on FPS franchises such as Halo, Call of Duty and Battlefield. The KeyMander is the perfect accessory for the PS4 Pro / PS4 and PS3. PWN your competition in multiplayer games against players that are still using controllers. Playing FPS, RPG and RTS games on the PlayStation has never been this much fun. What game consoles work with the KeyMander? Can I use a laptop with KeyMander in place of a stand-alone keyboard? a. Open the KeyMander software on the laptop. b. Connect the laptop to the KeyMander. c. Press [F12] to switch to Play Mode. d. The keyboard signals will be directed to the game console. To use the keyboard on the laptop, press [F12] again. Will a Sony Navigation controller work with the KeyMander? Yes, the KeyMander supports Sony’s Navigation controller as a normal game controller. Connect it to the KeyMander’s gamepad port. Please remember to change your controller ID in the PS3 system after all devices are connected. Will the KeyMander work with Wii or Wii U? No. The KeyMander supports only PlayStation 4, PlayStation 3, Xbox One, and Xbox 360 at this time. Can I use a wireless keyboard and mouse combo with KeyMander? Yes, when using a wireless keyboard and mouse combo with KeyMander, the wireless USB dongle must be plugged to the Keyboard port of the KeyMander. NOTE: Wireless keyboard and mouse combos are generally supported, but we are unable to verify every model on the market. Does the KeyMander support Bluetooth keyboards and mice? No. The KeyMander is not compatible with Bluetooth keyboards or mice at this time. What other kinds of peripherals will work with the KeyMander? The KeyMander also supports most USB Joysticks and USB Gamepads. Does the KeyMander support wireless game controllers? Technically Yes and No. KeyMander requires a wired controller in order for the system to function correctly. PS4, Xbox One, and PS3 original wireless controllers have the ability to function as a wired controller with the connection of a USB cable, so KeyMander supports these wireless controllers when connected in wired mode. The Xbox 360 wireless controllers are always wireless and use the USB cable only for charging, so they are not supported by KeyMander. For KeyMander compatibility with Xbox 360 a wired controller is required. Please note that original Microsoft Xbox 360 wired controllers do not have a detachable cable, so if your controller cable is detachable it is likely not compatible. Does the KeyMander require a PC to work on my game console? No, the KeyMander is pre-loaded with firmware that allows it to be connected directly to your game console without needing a PC. However, to configure the advanced settings using the KeyMander software requires the KeyMander to be connected to a PC or laptop. Will the KeyMander work with the basic keyboard and mouse that came with my computer? Yes, the KeyMander is designed to work with most USB based Keyboards and Mice. Can I use a gaming keyboard with KeyMander? Yes, however KeyMander does not support more than a standard 104-key layout, so extra macro keys will not function. Note: Not all keyboards are compatible due to the power requirements of some models. 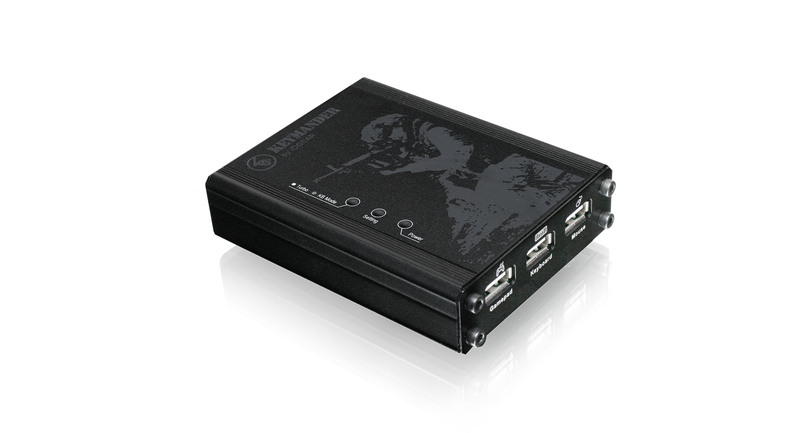 A standard USB port (like on a PS3) has a power output limitation of 500mA which must be shared between the KeyMander, keyboard and mouse. 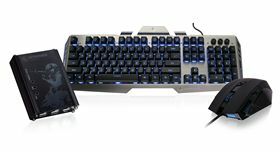 Some gaming keyboards with built-in headphone sound cards, USB hubs, LED backlighting, etc. can draw as much as 480mA on their own which means there is not enough current left for the KeyMander and mouse. In this situation an extra USB to mini-USB cable is needed (not included) and should be connected to an additional USB port or power supply like those commonly used for charging smartphones and tablets. There may also be certain keyboards that are not compatible because they require a specific software driver to work. Since KeyMander is not a computer there is no way to install and run computer drivers for the keyboard, so they will not be compatible. Most keyboards do work fine with KeyMander, but it is better to avoid keyboards with built-in USB hubs, sound cards, etc. Does the KeyMander support Macro keys on Gaming Keyboards, Mice, or Joysticks? No. The KeyMander only supports standard US 104-key Keyboard layouts. 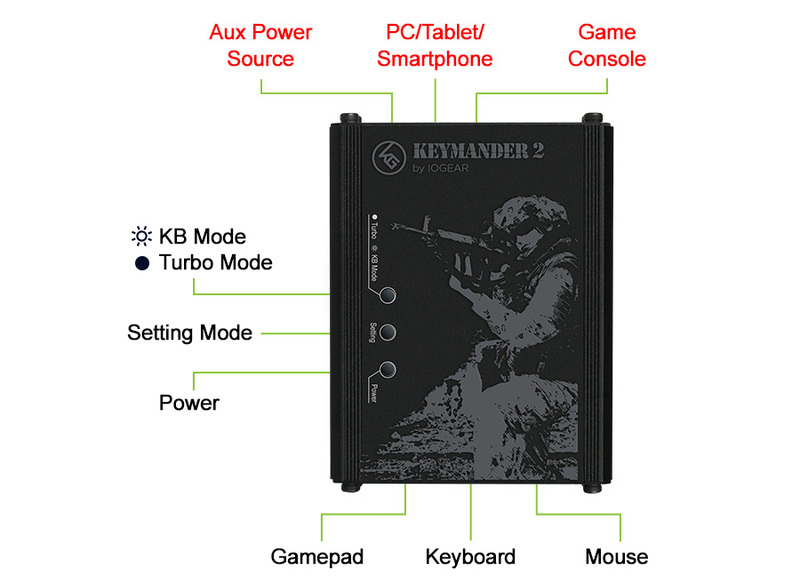 However, the KeyMander software has the ability to map up to 8 controller commands to a single button on your keyboard, mouse, or joystick. Does the KeyMander software support Mac or Linux? No. The KeyMander software currently supports Windows XP®, Windows Vista®, Windows® 7, Windows® 8 Windows® 8.1 and Windows® 10. What types of games are supported by KeyMander? 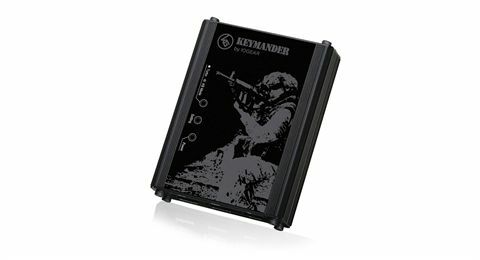 KeyMander is the ideal solution for First Person Shooter games, but since the KeyMander emulates the game controller of your console it will also work with any games in your library. Will my headset work when my controller is connected to KeyMander? 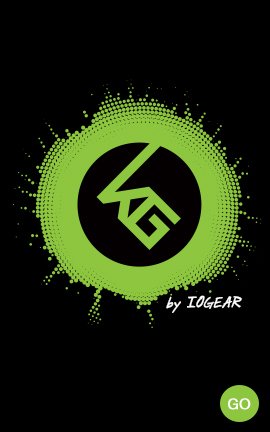 Xbox One – Headsets are not supported on the controller connected to KeyMander, however if you have a second controller you can connect your headset to it. If it is a wireless controller you will need to connect a micro USB cable to it so that it does not automatically turn off when sitting without use. 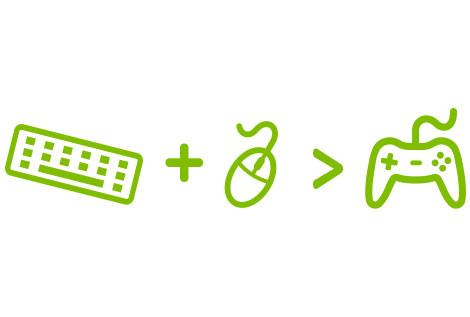 Xbox 360 – Wired headsets are supported through the original Xbox 360 controller. PS4 – Headsets are not supported on the controller connected to KeyMander, however a USB headset can be connected directly to the PS4. PS3 – Headsets are not supported on the controller connected to KeyMander, however there is a workaround to allow a headset to pass chat and game audio. Please see the support topic KeyMander Headset Connection for PS3. How do I fix mouse movement that seems to lag or is slow to respond? Poor mouse movement/slow response indicates the game sensitivity and KeyMander's mouse sensitivity are not properly set. For proper mouse performance you must first set the in-game X/Y axis sensitivity to maximum, and then set the KeyMander's mouse sensitivity using the KeyMander software. The software has a place to input your mouse's DPI setting and then options to adjust your X and Y axis and diagonal movement settings. Once set correctly the mouse movement will be as fast as you wish to play. The deadzone is a small area around the game controller’s thumbstick control that doesn't respond to stick movement. Deadzones are built into games so that old controllers with slightly worn out sticks will not cause movement when the control is sitting still. Depending upon the amount of deadzone built into the game, this may case a delay in mouse response or sporadic movements when playing games with KeyMander. Properly adjusting the deadzone removes any delay to the mouse and delivers significantly sharper and smoother movements, and much more accurate results when aiming-down-sight in FPS games. For this reason adjustment of the deadzone is strongly recommended. Please note that the deadzone settings should be adjusted for each game so creating a profile for each game and saving the settings using the KeyMander software is also recommended. Please see the support topics Deadzone Setting with KeyMander Software and Deadzone Setting without KeyMander Software. Turbo mode allows for rapid fire of any controller button function assigned to the keyboard or mouse, and has 3 speed settings. Turbo must be configured for the button using the KeyMander software, and the Turbo Mode must be enabled during the game for it to work. Press F10 on the keyboard while playing to enable Turbo Mode. Why isn't my Xbox One responding to my brand new KeyMander? All KeyMander models should be checked to make sure they are running the most recent firmware before initial use. KeyMander units with running firmware versions older than v1.1.104 must be updated before they will work with Xbox One. Tag a friend who needs this or share with someone who needs to buy this for you!